Those who are mildly toxic with mild symptoms will need a much simpler program to reach full recovery. 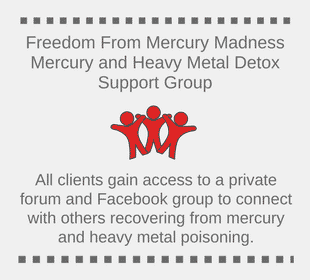 Mild mercury toxic cases can usually begin their restorative program by detoxifying the mercury first. Those who are moderately to severely toxic, will need to begin the program by first accomplishing what I call “The 9 Achievements”. 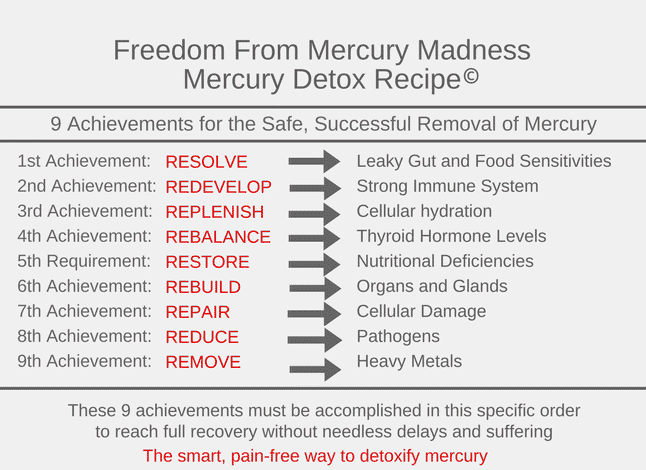 These 9 achievements are absolutely essential for the safe, non-problematic and pain-free removal of mercury and other metals. These achievements must first be accomplished to a certain degree before ever attempting to remove (detoxify/chelate) the metals. Otherwise, you will cause excessive nutritional depletion and cellular damage and exacerbate your symptoms causing you to suffer again and again from each attempt at removal, which causes set-backs in your recovery. You could actually reverse your progress or at best, improve your health only at a snail’s pace. About 75% of your immune system is the good, healthy bacteria that resides in the mucosal layer which surrounds the inner intestinal lining. This delicate, protective mucosal layer is easily damaged by mercury, other heavy metals and environmental toxins, as well as antibiotics, pain medications and the routine consumption of toxic food and beverages. Leaky gut and the development of pathogens, mast cell histamine release and poor assimilation and methylation result – all which lead to nutritional deficiencies and an hyper-sensitive immune response, causing sensitivities to toxins, foods, nutraceuticals, herbs and chronic inflammation. One must effectively restore this protective mucosal layer and inhibit mast cell production. Until this is achieved, your progress will be limited. Repairing the intestinal tract creates the foundation needed to accomplish everything else. 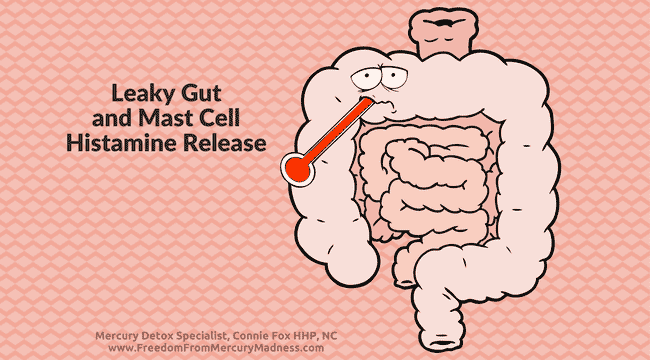 There is an effective way to reduce mast cell production and resolve a leaky gut condition and food sensitivities rather quickly and too many health professionals do not know how to accomplish this. It involves more than just probiotics, L-glutamine and a gluten and sugar-free diet! When the intestinal mucosal layer gets damaged, the immune system becomes compromised. Good bacteria is needed to protect against the growth of pathogens, to break down foods into assimilable forms and to produce virtually all B vitamins. To rebuild a strong, healthy immunity, it is imperative to recolonize various species of good bacteria. This cannot be done without also restoring the mucosal layer because it is the ‘house’ of the immune system. A healthy immune system contains 100 trillion of 1000 different species of good bacteria. The most common mistakes made with probiotic supplementation is all about quality and quantity. Many people think a few hundred billion good bacteria daily is a lot, because it sounds like a lot. A few hundred billion is only a drop in the bucket! The quality of good bacteria to be established is also of the utmost importance. Even many professional grade probiotics are simply not good enough for the mercury toxic. 3rd ACHIEVEMENT: REPLENISH CELLULAR HYDRATION. Cellular dehydration goes hand in hand with chronic heavy metal toxicity. Significant mineral deficiencies develop, acidosis and chronic inflammation. The tissue, blood and urine becomes overly acidic. This impairs the cell’s ability to efficiently absorb blood – and the water, oxygen and food nutrients in the blood. This also impairs the cell’s ability to excrete stored intracellular heavy metals. Improved cellular hydration can dramatically take your state of health to new heights and prepares you for the excretion of heavy metals. 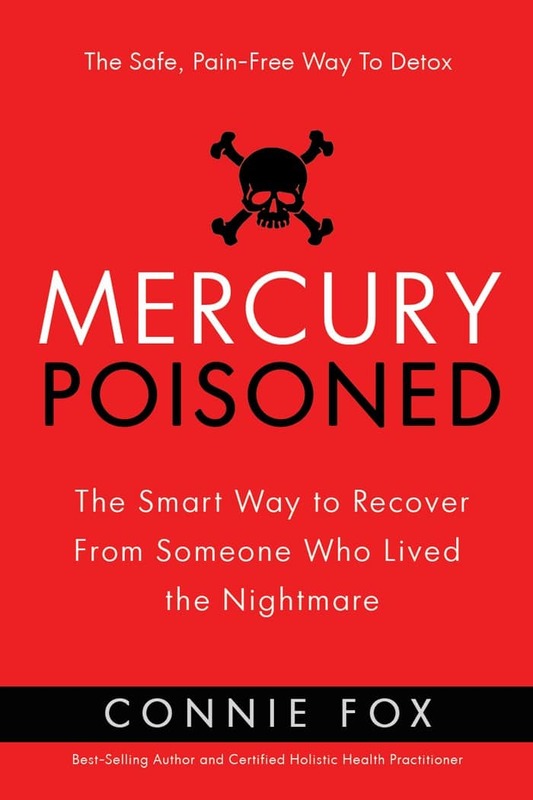 Moderately to severely mercury toxic cases often develop a hypo-thyroid condition because mercury binds to thyroid hormone like a magnet, ‘stealing’ it from the body’s cells. Thyroid hormone gives your body’s cells the energy needed to perform their function. With a hypo-thyroid condition, every cell, gland and organ in your body struggles to function optimally. A hypo-thyroid condition is often missed due to outdated and “incorrect” laboratory reference ranges, as officially stated by the American Association of Clinical Endocrinologists (AACE) in January, 2003. Due to the AACE’s more recent medical corrections (over 13 years ago! ), a more accurate thyroid reference range has been established. Ironically, most doctors STILL DO NOT USE THIS and laboratories also have not revised these updated reference ranges. Therefore, if your thyroid blood levels are “within the reference range”, the condition may be incorrectly interpreted as adequate. As a result, millions of people (mercury toxic or not) with a thyroid disorder remain misdiagnosed. For the success of your recovery, it is imperative to achieve balanced thyroid hormone levels and I go by the corrected reference ranges. Also, some health professionals have not yet learned how to smoothly and easily produce balanced thyroid hormone levels without the unnecessary ups and downs – and without pharmaceuticals or iodine and adaptogenic herbs. More severely mercury toxic cases have a more hyper-sensitive nervous system (nerve cells/endings) and immune system and therefore, cannot always easily tolerate these commonly recommended supplements for a hypo-thyroid condition. 5th ACHIEVEMENT: RESTORE NUTRITIONAL DEFICIENCIES. It is important to get the specific food sources needed to restore nutritional deficiencies and enable the body to efficiently neutralize and remove the mercury and other metals. To successfully manage this, specific food sources must be in forms that are extremely easy to digest and assimilate. Mercury acts like a magnet by binding to all minerals in your body. This further contributes to nutritional deficiencies. To avoid excessive cellular damage, improved cellular nutrition must first be achieved to a certain degree before detoxifying the metals. 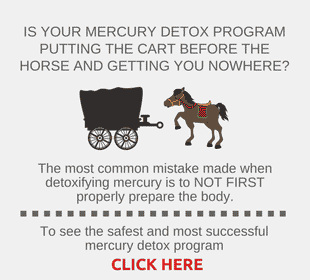 Attempting to remove the mercury prematurely causes exacerbation of symptoms, needless suffering and set-backs. 6th ACHIEVEMENT: REBUILD ORGANS AND GLANDS. 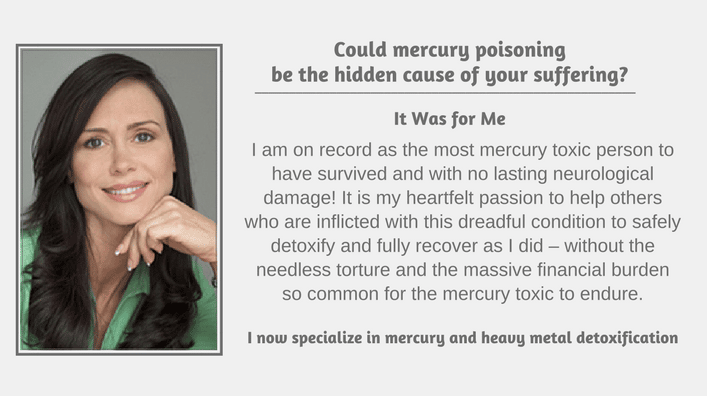 Moderately to severely mercury toxic cases have a more severe leaky gut condition, mast cell production, nutritional deficiencies, microbes and more toxic, sluggish and weak organs and glands. All organs and glands, particularly the nervous system, liver, kidneys and endocrine system need to be nourished, strengthened and protected to a certain level before forcing them to deal with more poisonous mercury and other metals during detoxification. If your organs and glands are not strong enough to handle the rigors of detoxing, symptoms will get worse and a set-back will result. You will have to stop detoxing and WAIT IT OUT, while giving your body time to repair the cellular damage. This causes unnecessary suffering and delays in your recovery. This can cause physical and mental debilitation. If you do this as a result of detoxing the metals before the body is properly prepared, there is likely nothing any hospital or doctor can do to help you. It is unnecessary to go through this during your detox program. Unfortunately, many health professionals do not understand this. Mercury causes damage to every cell it comes into contact with. This includes brain cells and the delicate myelin sheath (exterior coating of nerve cells), which impairs cellular communication. Mercury and pathogens get into organs, glands, brain cells, muscle tissue, fat tissue, bone – everywhere – and causes ongoing cellular damage. 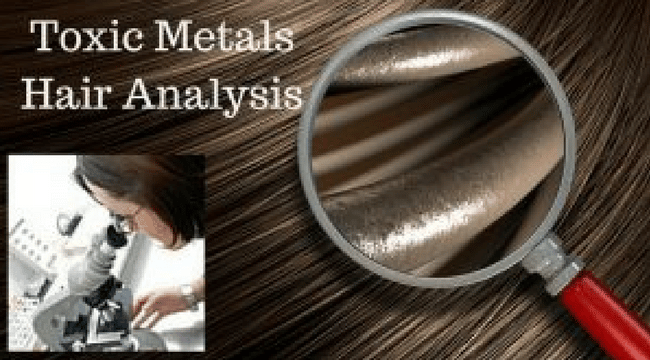 Repairing and protecting the cells to a certain degree before removing the metals is critically important. 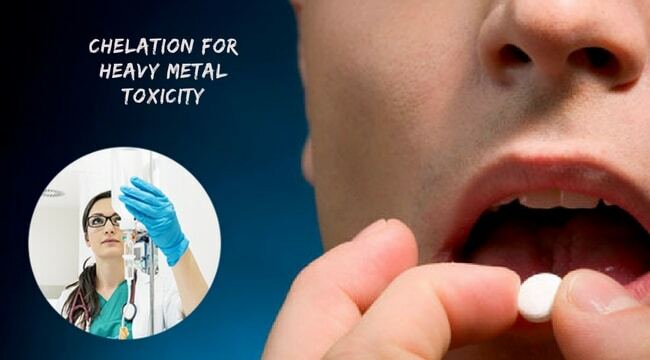 Heavy metal toxicity creates the perfect environment for harmful microbes to easily thrive and multiply. Unwanted microbes include bad bacteria, mold, candida, fungi, parasites and viruses As you make progress with the “Achievements”, you will begin to make more rapid improvement strengthening your body and reducing symptoms. Detoxifying becomes more efficient and the immune system will become strong enough to inhibit bad bug growth naturally. Until then, it is imperative to aid the body with reducing the growth of microbes and this involves more than being on a “candida diet” and taking some anti-microbial herbs. Believe it or not, removing the metals is the easy part! Accomplishing the first 8 achievements will have significantly improved your symptoms and stabilized your strength and vitality. 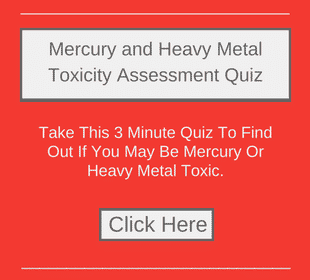 At this point, your body is thoroughly prepared and well-equipped to neutralize and excrete the mercury. And, with little or no exacerbation of symptoms. 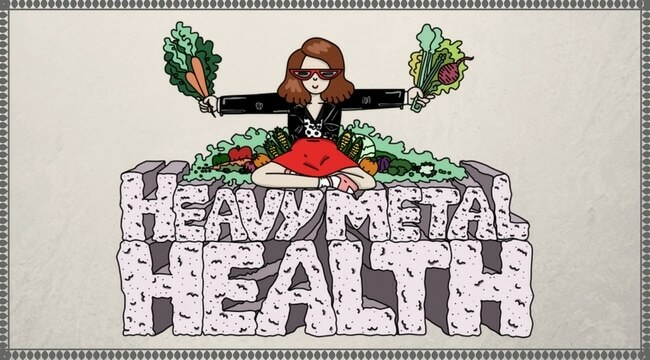 From here, progress continues at a more rapid pace and in time, all heavy metal levels are down to nil, the body is well-nourished to the core of each cell and each bodily system achieves homeostasis, functioning at their optimal level. Cellular damage, including brain and nerve cells repair and regenerate down to the DNA. The body becomes naturally alkaline and so clean from a lifetime of accumulated environmental toxins and cellular break down (premature aging). You will likely achieve a better state of health, vitality, clarity of mind and sense of well-being than you ever remember! After years of being bed-ridden in agony and isolation, I eventually learned how to accomplish this by applying these 9 Achievements, in this specific order. The body’s intelligence and capacity to heal and regenerate is unfathomable. We only need to learn how to give the body what it needs to heal itself and NOT interfere with that process. *This content is for informational purposes only and is not intended to diagnose, treat, cure, heal or prevent any disease, illness or health condition. Consult with your physician about any health or nutrition related matters.